General Hospital (GH) spoilers tease that Chase (Josh Swickard) could soon have another case on his mind. GH fans know that Mike (Max Gail) and Avery (Ava and Scarola) just went missing. Chase will certainly help out with the hunt, but what happens next? The show is undoubtedly setting up some shockers! There’s a reason why GH has had Chase interact with Mike on multiple occasions. Let’s think back to their first meeting. Chase insisted on doing everything by the book, so Mike was forced to spend the night at the police station. 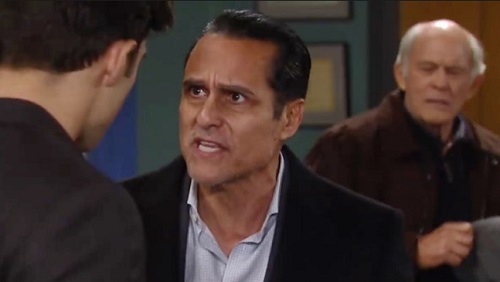 That obviously didn’t go over well with Sonny (Maurice Benard)! It set Chase up as an enemy of the mob boss from the get-go. That also proved that Chase will do whatever it takes to follow the law. He’s not keen on giving anyone a pass, so Sonny had better watch out! Of course, Chase showed a softer side when he found Mike with Liz (Rebecca Herbst) after the earthquake. He helped Mike out that night and it seems he’s about to do it again. General Hospital spoilers reveal that Mike and Avery will eventually be found safe and sound. However, there’s no guarantee that they’ll be found together. Mike could easily lose Avery while they’re out on their little adventure. He may be extremely confused when he finally turns up. Will Chase pump Mike for info on Avery’s location? Will he try to help Mike retrace his steps? If so, this could spell bad news for Sonny. Mike’s muddled mind could mix up the facts and suggest the field in Croton as an option. He might remember that it’s significant somehow and point Chase in that direction. It’s also possible that Avery will be found with Mike after all. When Mike realizes he caused total panic, he may feel like a criminal. This obviously wasn’t a malicious kidnapping, but that may not stop Mike from fretting. He may suggest that he deserves to be locked up, but Sonny could assure his pop that everything’s fine now. To ease his guilt, Mike may decide to come clean about other shady activities. That’d be another route to exposing what happened in the Croton field. Regardless, Mike seems destined to tell Chase the truth – or at least his version of it. General Hospital wouldn’t keep having them cross paths if it weren’t important. Will Chase head to the site of Sonny’s buried crime? Will he find the evidence and bring Sonny down? We’ll give you updates as other GH details emerge. Stay tuned to the ABC soap and don’t forget to check CDL often for the latest General Hospital spoilers, updates and news..
Will Chase head to the site of Sonny’s buried crime? Will he find the evidence and bring Sonny down? We’ll give you updates as other GH details emerge. Stay tuned to the ABC soap and don’t forget to check CDL often for the latest General Hospital spoilers, updates and news.